Day by day with car population on the rise, so are the problems related to car parking. Municipal corporations / governing bodies world over have implemented multistoried car parking schemes in congested areas in the city to ease the car parking problems. These Car Park Displays can be located at strategic locations such as main entrances, entrance approaches or zone/level transitions such that the vehicle driver will know the availability of spaces in advance and then move to a particular car park location avoiding hassles of locating an empty space. 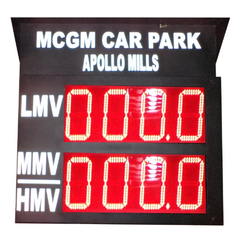 These displays have Wireless connectivity with central/local parking management system by virtue of GSM SMS or GPRS system. Thus the displays can be updated online and at any given period of time will provide the status in the car parking area. These displays can be customized to meet the need of a client. With additional information display, these displays can be used to inform about changes to parking arrangements or to give details about matters of interest or run advertisements etc. Display sizes: Various sizes available to suit requirement. Looking for Car Park Displays ?